I got these done yesterday but I didn't get home until 11:00. So I left them until today. Sorry about that. But pick-my-polish officially begins! Whee! 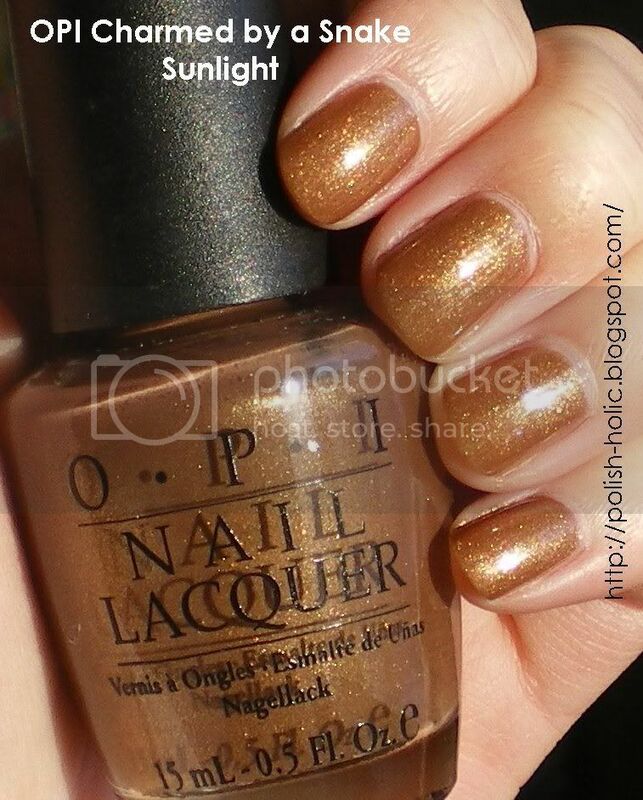 Charmed by a Snake is a light brown with gold shimmer. Very warm. It really does make me think of a snake. I'm not sure how, but it does. This is two coats and goes on wicked smooth. Sadly, I don't like the colour on me. I think it's just too warm for my already yellow skin tone. I had the same issue with OPI DS Illuminate. To participate in pick-my-polish month, please go here. oh i love this one! i think i might actually like it on my nails! Thanks Mels! I really liked this colour before I put it on. Too bad it just didn't work for me. looks like maple syrup candy. Huh...Never thought of it like that. I love this polish. Wearing a silk jacket to a wedding that is a light bronze and color goes beautiful. I am a black female with olive color skin so looks great I have this on gel nails and does not have an overbundant shimmer look. You've probably got the perfect skin tone to pull this off. Just not for me.